In Pro, Microsoft Word is used to generate all reports, documents, and labels. This means they are all completely editable on screen — on the fly. Add additional copy, notes, or terms to offers, price lists, invoices, spreadsheets, etc. — and save the edited results directly to the documents folder. Email to individuals or groups of contacts directly out of Pro via an email account. 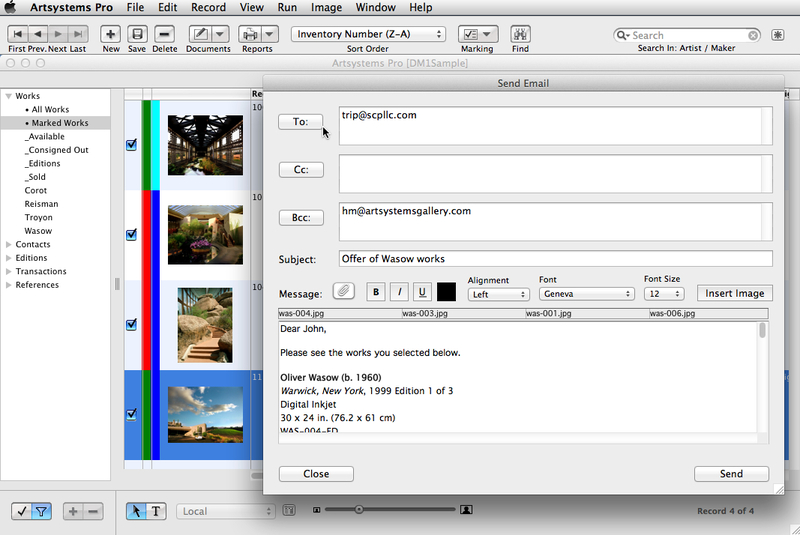 Images attach automatically when emailing a work or groups of works, and the email saves to the contacts' records. Saved emails appear in the user's regular email’s sent folder. 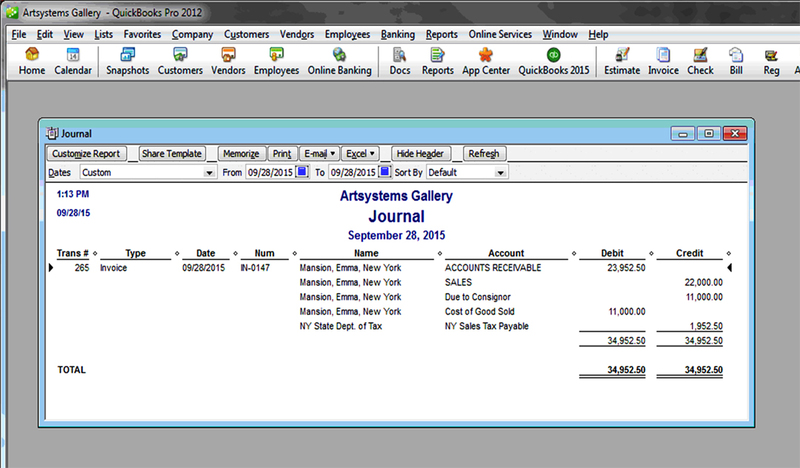 Artsystems Pro can link with both Mac and Windows versions of QuickBooks Pro as well as other third-party accounting packages — eliminating any need for a double-entry bookkeeping system. 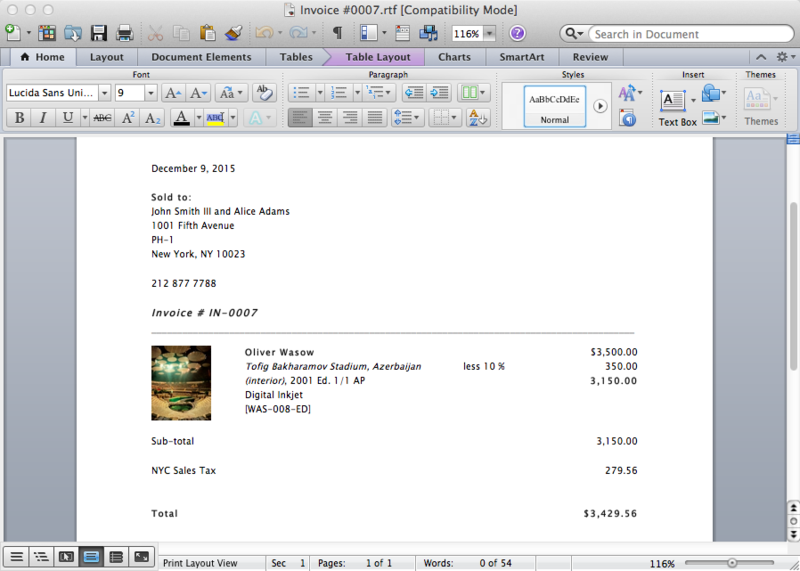 Invoices, Cash Sales, and Cash Receipts can import to QuickBooks Pro with just a few clicks. Users can also import their QuickBooks Pro chart of accounts into Artsystems Pro so that the accounts can be reconciled at the time of the transaction. QuickBooks Pro imports the client details, transaction type, and the financial accounts and values. The inventory piece, work title, and artist/maker name also download into the QuickBooks item list. No additional setup fees apply (hourly support fees may apply for third-party accounting software assistance). CloudSync Remote securely synchronizes Pro data, images, and reports between computers and servers across town or on the other side of the globe via the Internet. But since users have the software installed on their local computers, they can run the software offline when necessary. The database is time stamped, so laptop users can work off-line all day in situations without or with poor Internet and sync later when Internet is restored. Our LocalSync option does not even require the Internet or a CloudSync Remote subscription; users synchronize data when returning to their local network. Artsystems Pro Website CMS enables Pro data and images to flow quickly and easily to Artsystems elegant and fully responsive websites. All relevant info – images, artist, title, year, media, descriptions, type, and categories (tags) – for dozens of works at a time can populate users' online CMS (content management system) in minutes. And because WebManager and ProFile share the same CMS, users need only upload once to populate both their website and the ProFile app simultaneously. See the Pro Website page for more details on Artsystems mobile-friendly responsive integrated website solution. 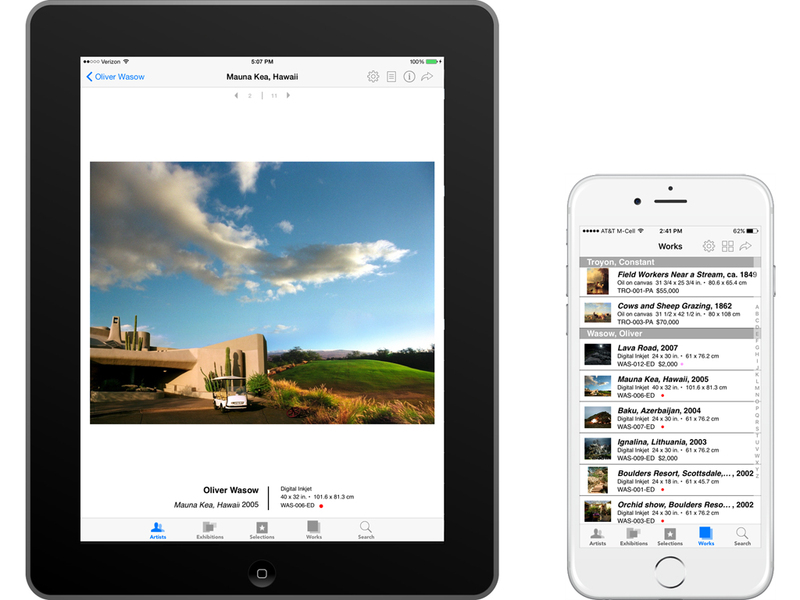 Like the WebManager, Artsystems ProFile artwork presentation app for iPad/iPhone works directly with Artsystems Pro data and images to display artwork images and information, along with additional artist and exhibition information in text and PDF format. 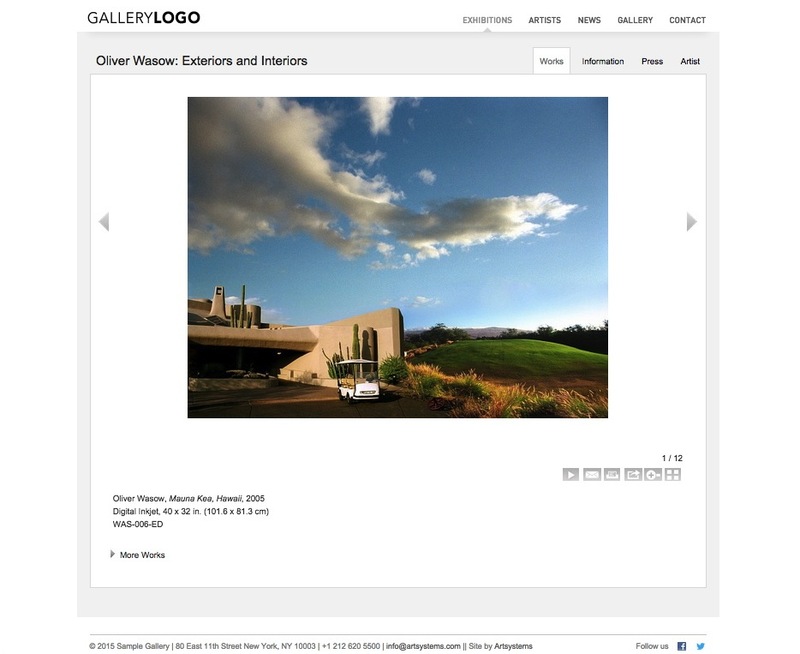 Users may send work images and details – artist name, title, year, media, descriptions, type, and categories (tags) — for dozens of works at a time to the ProFile content management system (CMS) in just minutes. Up to twelve additional custom fields of work data exported from Pro — such as source, location, or cost — may be added and viewed, optionally hidden behind a password to be viewed privately on their devices. And because ProFile and WebManager share the same CMS, users need only to upload works once to populate both WebManager sites and the ProFile app. See the ProFile page for more details on the app. Simply plug-in a bar code scanner or connect via Bluetooth and Artsystems Pro automatically associates Work inventory numbers to the scanner. Custom labels and reports are available for packing, shipping, or storage needs. 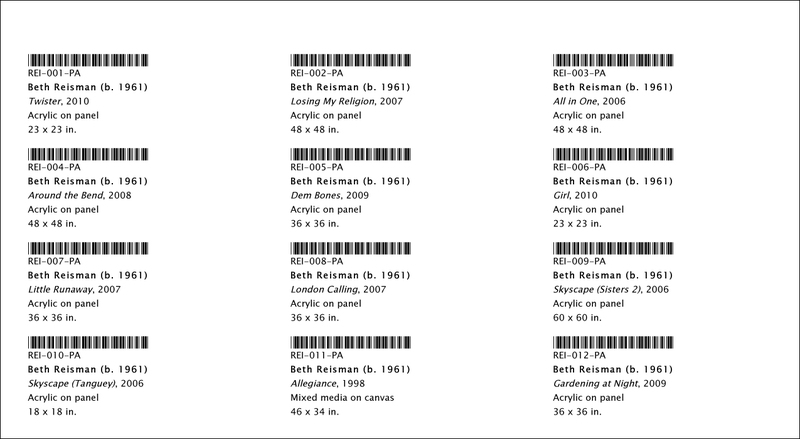 Artsystems will work with any 2D bar code scanner font to make the label templates for users to print as needed — with no extra fee.